According to Juniper Research, 31% of top-performing companies plan to use AI within the next 12 months. Advent of Chatbot development has already created numerous possibilities to enhance the customer experience. All the top players in almost every industry are now looking at Chatbot development to prove proficiency of them with cutting-edge technologies and adaptation from business perspective to increase brand loyalty and revenue generation. To those who do not know, TicketMaster is an on demand ticket booking marketplace app for thousands of events happening globally on the daily basis, be it sports, movie shows, premiers, musical nights, gigs and so on. Given its nature of business and huge market opportunities, many people have started investing in on demand ticket booking marketplace like TicketMaster. TicketMaster is actually responsible for bringing technology to the entire ticket booking industry worldwide. Hence, TicketMaster has become a part of strong and growing network of various players in the parallel markets of ticket booking such as Live Nation, Ticketsnow, Ticketweb and House of Blues. Read more on : How much will it cost to develop on demand ticket marketplace app like TicketMaster? As we have seen so far, Chatbots not only help people to get accurate information, they also can act as a virtual assistant, depending on the user queries. 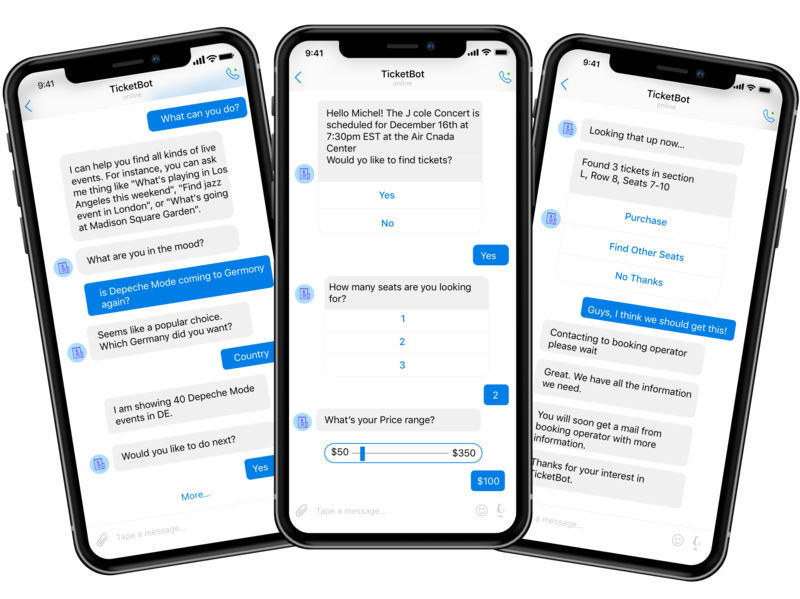 Just name a movie, music or sports event and let Chatbots handle everything from booking process that includes timings and seat selection to order completion with a receipt. They can also be programmed to ask and chat in a preferred language too. Hire Chatbot developers from Let’s Nurture, a leading Custom Chatbot development company in India, USA, Canada, UK, Australia and Singapore, who are well versed in working with SMS API, Google Geocoding API, DialogFlow, custom NLP engine and more to create a seamless conversational ticket booking application along with best-in-class Chatbot interface. 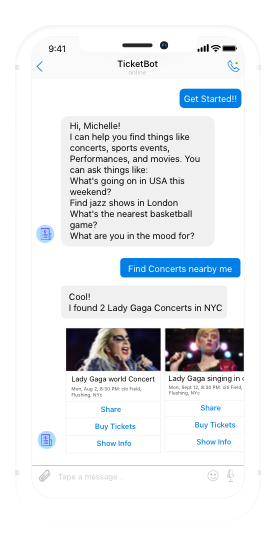 The total cost of developing a Chatbot system for ticket booking app will be in a ballpark range of $4000 to $6000. 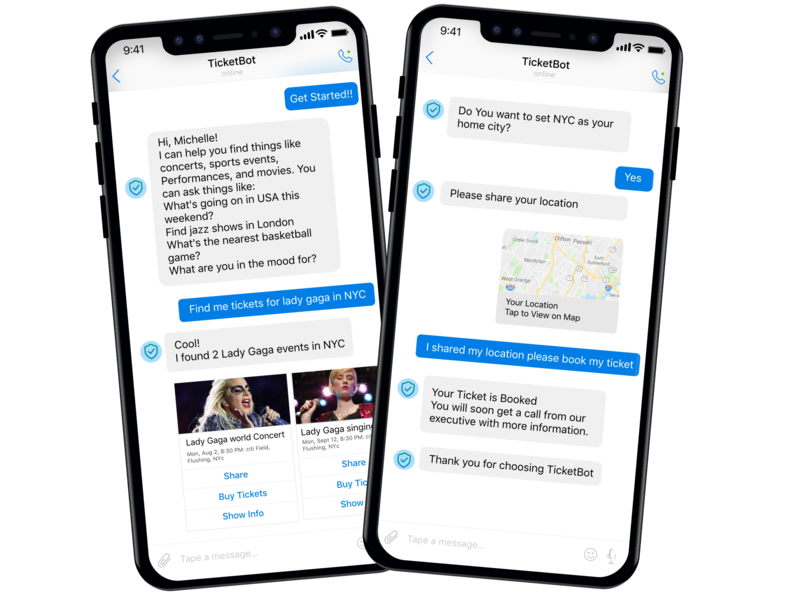 Let us have a look what a custom developed chatbot can offer for an event ticket booking app. TicketMaster is facing fierce competition from its top rivals like Vivid Seats, Etix, Ticketfly, etc. They all are the big players in the same industry domain. Imagine what would you need if you want to be a stand out performer and attract the app users at the same time! Innovation to provide a unique and long term solution with seamless possibilities is the key. AI Chatbots are powerful with a vast knowledge to be efficient while having a conversation. Chabots have the ability to handle and take action for multiple conversations/ bookings simultaneously. Chatbots save time by instant and accurate information- hence boosts user experience and customer retention. Chatbots prevent sluggish ticket booking processing and ensures smooth operations. Tracking of loyal customers makes it easy to give promotional offers and discounts. Customer preference is restored before giving options about event selection categories. For a unique, robust and scalable ticket booking app development, following is the resource team Let’s Nurture can offer on full-time and part-time basis. Why Choose Let’s Nurture for Custom Chatbot Development? Chatbot developers at Let’s Nurture are masters in developing bots of multiple types. The bots we develop are AI Chatbots, Enterprise Chatbot, Tailor made custom Bots, Flow based IVR and online Chatbots. Our quality driven chatbot development process offers a complete package to develop innovative chatbot solutions for Facebook, Twitter, Slack, Kik, Microsoft and so on. So what are you waiting for! Get your ticket booking business a strategic advantage leveraging Custom Chatbot Development.